To create a butterfly garden with a difference – shaped like a butterfly and filled with a kaleidoscope of colourful nectar plants – to inspire young and old people alike to look after New Zealand’s butterflies when they come on school visits or from gardening clubs etc. When I started, the garden was all laid out and ready to go – but how much will the seeds and plants cost – compost and bird netting and all those sundry other things that are required when you’re working on a new project? Compost is home-made. The mulch should mean that the garden won’t dry out over the summer. 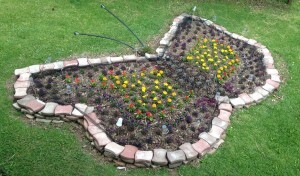 The finished garden should attract butterflies and bees, so very environmentally friendly. I will be constructing this with the help of volunteers and friends. The space is about 10m x 4m. It will be completed by the end of October 2013, and should be in place all summer. You are currently browsing the Madam Butterfly weblog archives for October, 2013.